As you look forward to the summer months, you may be feeling dissatisfied with the current state of your outdoor living areas. A drab, dull gray patio doesn’t exactly inspire daydreams of swanky garden parties or luxuriating in the sun with a mojito. Whether you’re building a patio from scratch or just updating your existing space, you should consider these exciting new trends that are taking the internet by storm in 2018. An elegant option for personalizing your patio is a custom inlay. Experienced builders can create beautiful works of art using stone or bricks, either incorporating it into the existing design of your patio or forming a bold new centerpiece. If you’re looking for something subtle, a stone border can add some interest to your patio without drawing too much attention. Other options include stone or brick mosaics, shapes like mandalas or stars, or brightly colored stones circling a fire pit or table. Retaining walls are an unfortunate reality if your patio doesn’t sit on level ground. They are typically designed to prevent soil erosion, and most people consider them to be nothing but a practical necessity. It doesn’t have to be that way! A recent DIY trend is finding second uses for retaining walls, such as turning them into seat walls. The perfect dimensions for a comfortable seat wall are 18 inches in height, and 12 inches in depth (the surface you’re sitting on). If your retaining wall doesn’t fit that criterion, you could consider adding a smooth capstone to the top of the wall or using outdoor cushions to pad out the space. Another common addition to a seat wall is lighting. Recessed core-drill lighting set into the side of the wall is a popular choice, but there are other creative ideas, such as lanterns, globe lights, or even strands of bistro lights. Another way people are creatively working around the problem of sloped yards is by building multi-level patios. This can not only maximize the usable space available, but it also creates a visually stunning addition to your landscape. Some homeowners use each tier for a different purpose – such as a dining area and a relaxation area, or a recreation area and a fire circle. Others maintain a consistent atmosphere across all levels. Multi-level patios are also perfect for smaller yards, as the different elevations allow the patio to take up less real estate than it would if it were all at ground level. However, even the most ardent DIYer should consult with a professional before building a multi-level patio. Once you raise your patio above a certain height, your city may require permits or have codes you need to follow. A professional will also be able to calculate the grade of your yard and minimize soil erosion, as well as accounting for ground shifts. If you primarily use your patio for outdoor dining, you may want to consider the addition of a built-in table. If you’re picturing a drab wooden or concrete table like the ones found in city parks, think again! Innovative homeowners are building stylish furniture with features like built-in coolers, LED backlights, and even hibachi grills. Since these tables are anchored to the ground, people in tornado-, hurricane-, or storm-prone areas don’t have to worry about their beautiful work of art being carried away by the wind. Though fire pits have been popular for most of human history, many homeowners have shifted to the use of fire rocks as an alternative to wood. 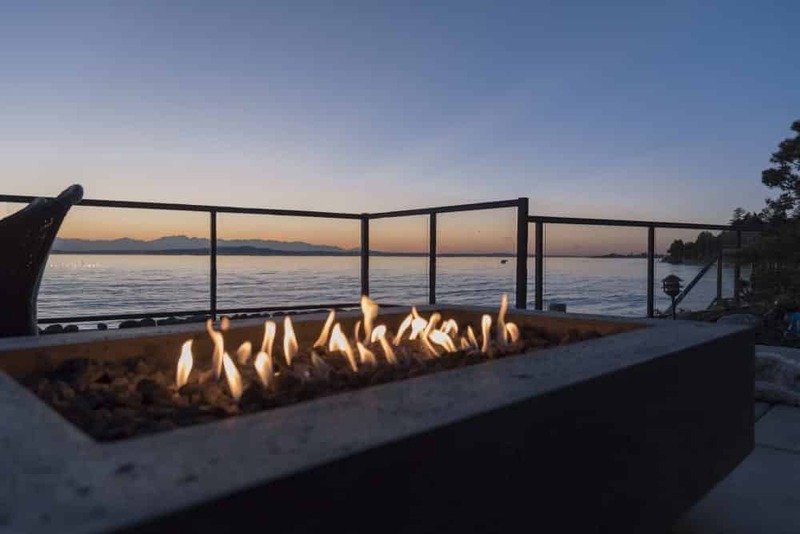 If you love the warmth of a fire but hate the smoke and cinders, you should consider switching to a gas fire pit with fire rocks (also known as fire glass) instead. Fire rocks come in many varieties, with a choice of colors and finishes to match any décor. Fire glass is designed to last, and won’t melt or become discolored even after frequent use. Running a gas line to your fire pit will require a professional, but after that, the maintenance will be minimal.